It all starts with a phone call. When prompted, please enter your zip code so we know appoximately how far we will be traveling. We'll need to know the nature of your problem and if you consider it an emergency. This way, we can try to get the best plumber scheduled. Once you've scheduled one of our plumbers, you can move on to the next item on your list. Time is valuable. We don't waste it. How can we help you? 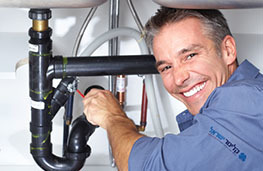 At Town Plumbers we want to solve your plumbing problem FAST.